If pigs ran track, this speedy porker would nab the gold. 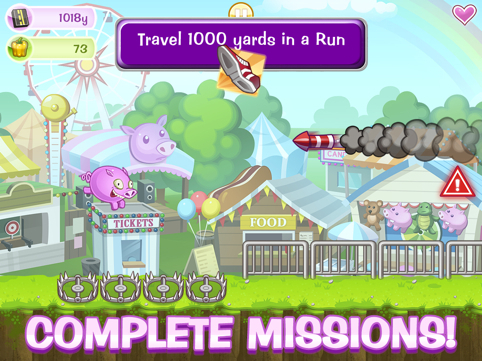 Ham on the Run, an iPhone and iPad game from Glu Mobile, hits the App Store this Wednesday. What type of game is it? An endless runner, one with a barnyard theme. Seems like a welcome change of pace, considering that most games in this sub genre take themselves way too seriously. On that note, Ham stars a pig of the same name that, much like Forest Gump, can't stop running. With this in mind, you'll help guide the porker through a never-ending 2D obstacle course, making use of power-ups and grabbing tickets to spin a wheel that may result in prizes; this somehow ties into the leaderboards. Not only that, but there are well over 150 missions, as well as in-game score markers for your friends. Yes, it's another running game, but the online features have us intrigued. We'll post a review later this week. In the meantime, watch the first trailer, and check out the screenshots.